Chicory (Cichorium Intybus) other names: Achicoria, Barbe de Capucin, Blue Sailors, Cheveux de Paysans, Chicorée, Chicorée Amère, Chicorée Sauvage, Cichorii Herba, Cichorium intybus, Cichorii Radix, Common Chicory Root, Écoubette, Hendibeh, Herbe à Café, Hinduba, Kasani, Kasni, Racine de Chicorée Commune, Succory, Wild Chicory, Wild Endive, Yeux de Chat. The plant known as the chicory, or the succory, is a member of the daisy family of plants - Asteraceae. The botanical name or the plant is Cichorium intybus L., this is a perennial herb. Chicory is native to Europe and originally grew only there, however, chicory has been transplanted to other places and is now found growing in wild on the side of roads as well as in fields in North America and other temperate regions of the world. The chicory herb can reach from three to more than five feet when fully grown. Chicory is a very conspicuous plant because of the attractive azure blue flowers it bears in season. Roasted chicory root is used as an additive in coffee, and the plant has been cultivated in large commercial plantations in Europe for many years to meet the demands of the beverage industry. The roasted chicory root is sometimes used as a coffee substitute as well aside from its use as an additive in coffee. The leaves of the chicory plant are also in demand in markets around the world; the leaves are used in the preparation of salads and eaten raw as greens. One result of active cultivation of the chicory is the existence of many cultivated varieties of the plant. These different varieties of the chicory differ from one another mainly in the size and the texture of the leaves and the roots. The root of the chicory is utilized in traditional European folk medicine; the root is mainly used in the role of a mild and non irritating general herbal tonic. The root of chicory was also employed as a general herbal diuretic remedy and particularly valued for its laxative effect. Traditionally, the chicory is stated to benefit the liver by protecting it from the effects of excess coffee, the chicory is also said to be a counter stimulant alleviating the deleterious effects of drinking excessive amounts of coffee. In present day Egypt, the root of the chicory is still valued as a traditional folk remedy for treating tachycardia - rapid heartbeats in a person. Chicory leaves, which have been bruised are seen as a good poultice for external complaints on the skin, and bruised chicory leaves are often applied to bring relief from local swellings and inflammation of the skin. The leaves of the chicory are additionally valued as a leafy green vegetable being relished as a vegetable dish. The root of the chicory has been used in the folk medicine of Pakistan for treating liver disease and hepatic system related disorders. Chicory has no known severe side effects associated with its consumption. This is not surprising as the chicory has been consumed in very huge quantities by many people down the centuries and except for reports of an occasional allergy that are no known serious effects of long term use. This lack of a side effect and the harmless nature of the herb also make it difficult to believe that it has any ability to bring on pronounced physiological or therapeutic actions on the human body. Whatever it may be, the inevitable conclusion is that the chicory is certainly as safe if not safer and produces much less of an effect on the nervous system and on the heart than caffeine containing coffee - a plant with which it is usually mixed and sold. 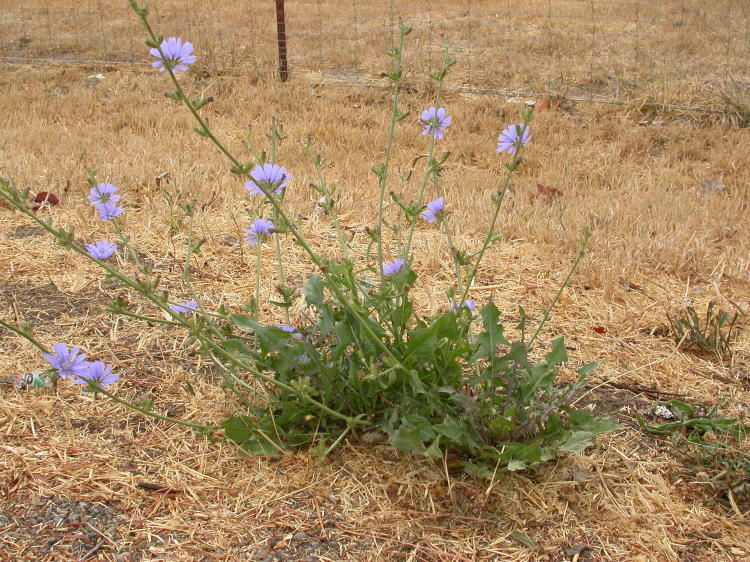 In many countries, the chicory can be seen growing wild in fields and pastures and along marginal areas such as roadsides and wastelands. 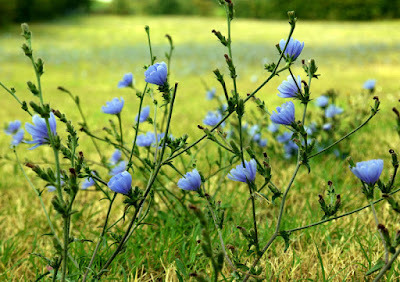 Gardeners are often irritated by the propensity of the hardy chicory to sometimes pop up in the midst of well maintained lawns and gardens. Cultivated varieties of chicory are often grown as vegetables in gardens and fields; however, these must not be mistaken for the wild variety of the chicory. The chicory is a small perennial herb. The taproot of the chicory resembles the root of the dandelion herb. Chicory is easy to identify due to the lovely and striking blue colored flowers and the generalized unkempt appearance of the herb. The branches of the chicory are set off angularly from the main stem, giving the chicory a straggly appearance. The arrangement of leaves on the plant is rather sparse compared to other herbs of similar size. The stem of the chicory is clasped by the bases of the leaves in a peculiar manner. Large and somewhat hairy leaves are seen at the base of the plant, and this appearance of the plant resembles that of the dandelion to some extent, this is the reason that the chicory is known by the nickname of “blue dandelion” in Europe. The roasted root of the wild or cultivated chicory is used as an additive in coffee or even as a substitute in many European countries, chicory may be added just to balance the flavor of coffee in these countries. Green salads eaten in some parts of Europe also tend to include chicory leaves. The chicory root is steamed or boiled by some European cooks, it may then be seasoned with some butter, other herbs, and spices before it is eaten. Only the dubious role played by chicory in the garden is the only thing that some people may want to see, however, people who are familiar with the medicinal value and beneficial properties of the chicory praise this wonderful herb. 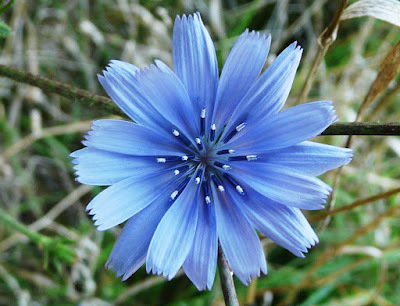 Chicory was extensively used in folk medicine; traditionally chicory root was employed in the treatment of problems such as jaundice and other liver disorders. However, the efficacy or curative nature of such folk treatments using chicory has not been substantiated by any current scientific studies. Chicory leaves also possess healing properties when they are used in herbal remedies. The leaves are first softened, bruised and the soaked for a few minutes in boil water that has just been removed from the stove. An herbal poultice made from leaves of the chicory plant serves as a traditional treatment in Europe and the US for all kinds of lacerations on the skin, as well as to treat swellings and inflammation on the skin. The tender leaves are collected and used in the kitchen, often added to salads; the leaves must be plucked before the plant gives off flowers. Eating the tender leaves is believed to bring a salutary effect on the functioning of the liver and the kidneys; this beneficial effect is similar to the action of the bitter leaves of the dandelion plant. Herbalists classify the leaves of both the chicory and dandelion plants as having a warm and moistening effect on the body, the roots of these two plants are however, said to bring on a warm and drying effect on the body. When compared with the dandelion, it can be said that the traditional medicinal properties associated with the chicory - such as a tonic, laxative, and diuretic effect - are quite similar. The use of the chicory and the beneficial properties of the plant were known to the herbal medical community of many ancient societies - the chicory was used both as a medicine and as a food. For example, the chicory was used by the ancient Romans to treat disorders of the liver. Chicory was also often prescribed by herbalists of recent centuries to cure a whole host of ailments; the herbalist of the middle ages often recommended herbal remedies made from the chicory roots as tonics, as laxatives, and as diuretics. Swollen and inflamed skin was usually treated using an herbal poultices made from bruised chicory leaves. The milky sap of the chicory plant was once looked upon by herbalist as a divine sign that the juice would be an excellent remedy for nursing mothers who could not feed their babies due to problems with lactation. Chicory is indigenous to Europe and originally grew only on that continent. Today, the chicory is also found in parts of North Africa and Western Asian countries. 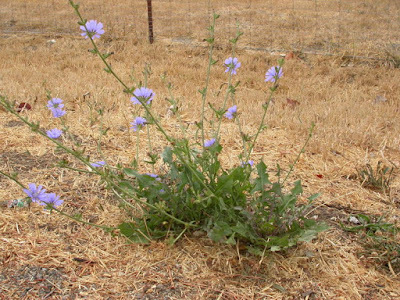 The preferred site of the chicory is along foot paths and on roadsides, on river banks, and along dry fields or fallow land. Chicory roots are dug up and collected during the fall or in the spring. Chicory is also used as a “tonic,” to increase urine production, to protect the liver, and to balance the stimulant effect of coffee. Remedies made from the chicory are a very effective and mild bitter tonic to alleviate problems affecting the digestive tract or the liver. In terms of therapeutic value, the chicory root remedy has a similar action to that made from the root of the dandelion herb - botanical name Taraxacum officinale. The chicory herbal remedy boosts the functioning of the stomach and the liver, while cleansing and detoxifying the urinary tract at the same time. In herbal therapy, the remedies made from the chicory are used to treat various rheumatic complaints and disorders such as gout. The chicory also acts as a mild laxative herb, and is especially suited for treated children affected by constipation and other digestive disorders. Digestion is also aided by the infusion made from the leaves and flowers of the chicory. Pregnancy and breast-feeding: Taking chicory by mouth in large amounts is possibly unsafe during pregnancy. Chicory might start menstruation and cause a miscarriage. Not enough is known about the safety of using chicory during breast-feeding. Stay on the safe side and avoid use. Chicory allergy: If you are allergic to chicory, don’t take chicory by mouth or handle it.